VJ with fellow students Kojo Basoah Fobri (blue hoodie) and Muhammab Syafiq Afham. VJ with husband Selva and son James. Thousands of miles from her birth home in Tamilnadu, India, a student is inspiring those around her with resilience and determination. University of Sunderland Master’s student Vijayalakshmi Subramani – known as VJ – has risked it all for a better education to help herself, her family, and those around her. 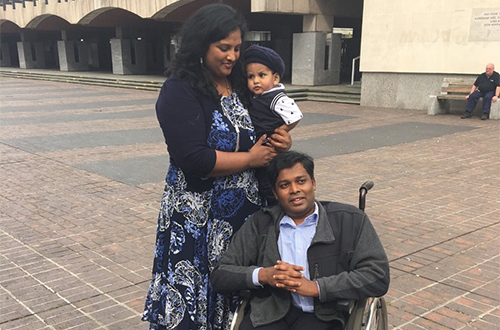 Giving up a full-time job with Sunderland City Council, she decided to return to university in the hope of building a better life with husband Selvakumar and son James. Now, inspired by her kindness and willingness to always support others, VJ’s fellow students have nominated her for a new campaign – Rate Your Mate - which aims to shine a light on hard working students who go above and beyond in their studies, life and work while at the University. VJ, currently studying MSc in Environment, Health and Safety, arrived in the UK from India in 2009. Her husband Selvakumar, 38, had been diagnosed with Polio when he was just one month old, meaning he has spent his life in a wheelchair. While son James, who is just three-years-old, has been in and out of hospital suffering with Asthma, Eczema and also having been diagnosed with Autism. But despite all the obstacles she has faced in life, VJ, 33, has always been keen to put others first and, since enrolling at the University last year, has been supporting her fellow students, organising events and keeping everyone on the right track. 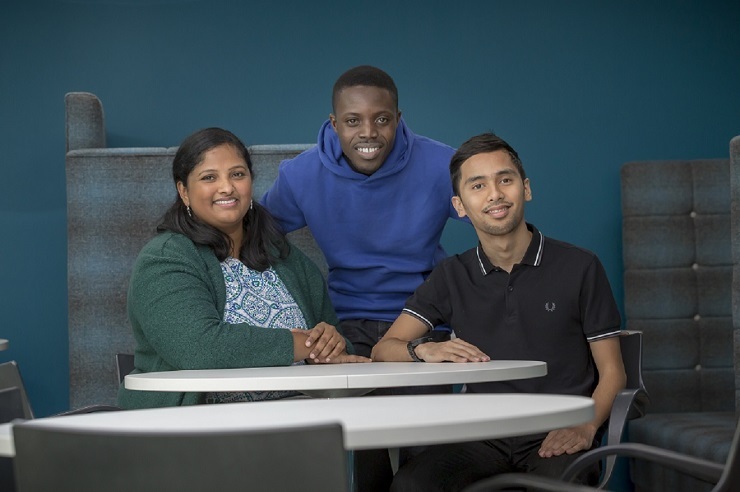 Her kindness has now been repaid after friends Kojo Basoah Fobri, 24, Muhammab Syafiq Afham, 22, and Brian Martin, 30, nominated her for Rate Your Mate. VJ said: “I was born and brought up in a village of Tamilnadu, India. We did not even have our own toilets until I was 21. “Even though we were struggling with just basic needs, my dad could put me in a convent school. “I did not have much opportunity to learn new skills in a small village. But I did reasonably well in my studies. “I wanted to do engineering in computer science but I could not get in to university because we couldn’t afford it. But I ended up getting a place in BSc in Catering Science and Hotel Management with scholarship, so my dad had to pay only a little bit of money to a university education. “I ended up in the UK in November 2009 and have gone through quite a challenging time. “My husband Selva is a short story writer and blogger. I used to read his stories, became his fan, then we became friends and we got married and our James was born. Before VJ started on her Master’s at Sunderland, she had been working as a catering supervisor for school meals with Sunderland City Council. She said: It wasn't easy coming back to studies after 14 years. It’s challenging to meet Selva's needs due to his disability, James' health condition and keep up with University studies. But I must thank my lecturers Dr Monica Price and Dr Mary Argyraki who supported me since beginning. “I’m thankful and happy that some of my friends have identified and recognised me for this award nomination, but the real success is someone getting inspired by my story, to come out of their home to develop their qualifications and enhance their skills. VJ, who lives in Hendon, Sunderland, says she is a prime example of the importance that education plays in life. VJ has also been supporting friend and fellow student Kojo who came to Sunderland from Ghana last October.